How perfect is it that a Friday the 13th falls in October? Now if we’d only had a full moon on Halloween, this month would have been complete! I have a confession: I’m a total weenie when it comes to scary things. I avoid horror movies and can only read the occasional scary book. Chalk it up to having an overactive imagination, but if I watch or read anything scary, I spend days looking over my shoulder and wondering what’s lurking in the dark. 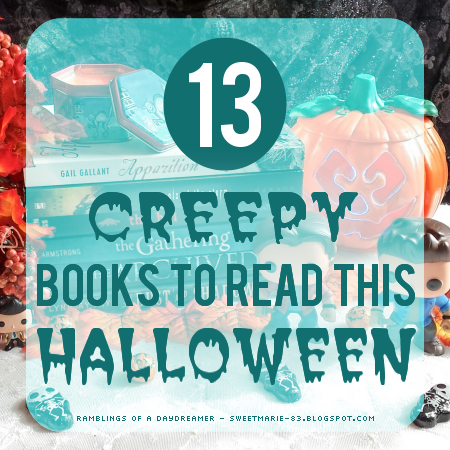 That being said, I have a lifelong love of Halloween, and in October I tend to venture into the territory of creepy, spooky, sometimes even downright scary books (and TV shows). I know a lot of other people do the same, so I figured what better day than Friday the 13th to share some book recommendations. Hands down the scariest book I’ve ever read. This book was put-it-in-the-freezer scary (if you get that reference, we need to be friends). Set a year after a devastating hurricane sweeps through Savannah, Georgia, leaving a path of destruction and death, the main character begins to realize the hurricane was more than a force of nature, and there are all kinds of horrifying, sinister things lurking in her city...including her best friend, who died the night of the storm. A wonderfully creepy retelling of the Lizzie Borden story, told from the perspective of their maid. This book had me wound so tightly from all the tension and mystery; it was like a ghost story, except the things lurking in the shadows were real people and an aura of madness that permeated the entire house. If you like ghost stories, this is a must read. It’s spooky, exciting, suspenseful, and gruesome. “Imagine a place where the dead rest on shelves like books.” Yes, this is absolutely as creepy as it sounds. This book is a unique, haunting story with lots of mystery and action, plus if you’ve ever read a book by Victoria Schwab, you’ll know you’re in for something beautifully and compellingly written. When I first heard of this book, I didn’t need any other details besides the title. I’m one of those people with a sick fascination of the Jack the Ripper and that time period in London. This book put a different spin on it in many ways; it’s usually men (police, Sherlock Holmes, hapless wannabe detectives) who are on the hunt for the elusive killer, but in this case, it’s a teenage girl who has an intense interest - and knowledge - of the ‘gruesome practice’ of forensic medicine. And the ending! Completely horrifying, shocking, and amazing. We all know about Jack the Ripper and how he terrorized London in the late 1800s, right? But did you know during the same time, there was another serial killer on the loose, one who chopped women into bits and threw their torsos in the Thames? As gruesome as these murders were, they were overshadowed by the media sensation caused by the Ripper. This book, though, focuses on the Thames Torso Killer. It's dark, gritty, and fast-paced, and weaves together the supernatural with horror and mystery, all with a backdrop of the shadowy, gaslit streets of London. 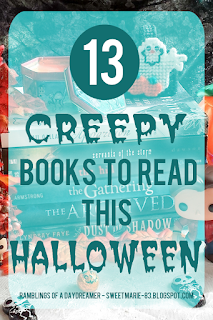 Some books are more spooky and creepy than they are scary, but this book is all those things. There’s a dark, sinister vibe to the mystery in this book, and it’ll keep you flipping pages to find out what happens. This list so far has ghosts, demons, various monsters, plus evil people, but it's lacking a classic horror creature: the werewolf. Hemlock isn’t your typical werewolf story; lupine syndrome, aka the werewolf virus, is sweeping through the nation. Many people who are infected try to hide their symptoms, but an extremist group called the Trackers are on the hunt, and lupine syndrome comes with a healthy dose of bloodlust that’s difficult to control. Dark, suspenseful, and compelling, Hemlock is perfect for fans of urban fantasy. I couldn’t have a list of creepy books without including one by the Queen of Urban Fantasy, Kelley Armstrong. The Gathering is a unique spin on shapeshifters. This thrilling, action-packed book is full of secrets and mystery, plus plenty of supernatural creatures. A modern-day retelling of Macbeth with queer characters, As I Descended is a dark, suspenseful, often disturbing story about revenge, jealousy, and the lengths people will go to for what they want. This is a very atmospheric horror story with a hint of the paranormal. Another Jack the Ripper story? What can I say, I’m obsessed. This one throws in something else I’m obsessed with: Sherlock. Or, more accurately, John Watson, who narrates this dark tale of murder and mayhem on the streets of London. If you’re a fan of Sherlock, this is an absolute must-read; it’s clear Faye did her homework on this dynamic duo, along with the Ripper cases, and late 1800s London. Stuck in the Alberta wilderness after a plane crash, two boys fall into a parallel universe of sorts where they’re hunted by a monster of Cree legend. When I found out this book was set in New Orleans and featured the manager of a haunted tour who began seeing the dead, I was like SIGN ME UP. I read this book years before I started blogger, and I still about it often and plan to reread it this fall. I love Graham's Harrison Investigation series, but Ghost Walk was my first and remains my favourite. Thank you for all these creepy books. I must add them to my wishlist. I've only read Anna Dressed in Blood and that is definitely an Halloween reading. I don't know if you have read Say Her Name by James Dawson, but it's a very creepy book -only because you will find yourself listening to water dripping everywhere.